Venues: Australia and New Zealand Dates: 25 October to 15 November Coverage: Watch England matches live on BBC TV, online, tablets, mobiles and BBC Sport app. 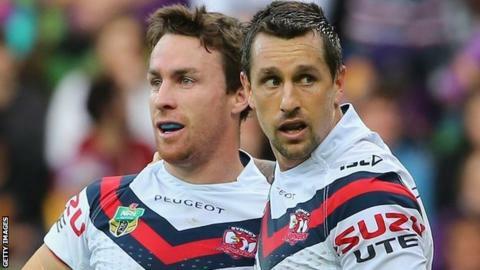 Half-backs James Maloney and Mitchell Pearce are two of eight Sydney Roosters players added to Tim Sheens' Australia training squad for the Four Nations. Aidan Guerra, who played for Italy at the 2013 World Cup, Boyd Cordner, Michael Jennings, Dylan Napa and Jake Friend are also selected. Fellow NRL semi-finalists Penrith Panthers have three call-ups in Matt Moylan, Josh Mansour and Adam Docker. The full squad for the tournament will be confirmed on 12 October. North Queensland's James Tamou, Cronulla's Luke Lewis and Manly's Brett Stewart have all withdrawn. South Sydney Rabbitohs play Canterbury Bulldogs in the NRL Grand Final on 5 October, after which players from those two clubs will be added. This year's series begins on 25 October will see the Kangaroos take on New Zealand, England and Samoa. Sheens and NSW Blues coach Laurie Daley have also named the squad for the Prime Ministers XIII match against Papua New Guinea Kumuls - also on 12 October - with New South Wales back-rower Greg Bird taking the captaincy. West Tigers' skipper Robbie Farah is also involved, as are the uncapped Moylan and Mansour. "This match also provides a great opportunity for young players like Matt Moylan, Josh Mansour, Sione Mata'utai, Anthony Milford and Dylan Napa to gain experience alongside regular international players," Sheens said. Matt Moylan, Josh Mansour (Penrith Panthers), Ryan Hoffman, Will Chambers (Melbourne Storm), Sione Mata'utia, Beau Scott (Newcastle Knights), Daniel Tupou, Dylan Napa (Sydney Roosters), Anthony Milford (Canberra Raiders), Ben Hunt, Josh McGuire (Brisbane Broncos), Aaron Woods, Robbie Farah (Wests Tigers), Josh Papalii, Jack Wighton (Canberra Raiders), Greg Bird (Gold Coast Titans), Michael Morgan (North Queensland Cowboys), Brenton Lawrence (Manly Sea Eagles). Ben Hunt, Corey Parker, Josh McGuire, Sam Thaiday (Broncos), Gavin Cooper, Johnathan Thurston, Matt Scott, Michael Morgan (Cowboys), Jarryd Hayne (Eels), Beau Scott, Kurt Gidley, Willie Mason (Knights), Matt Moylan, Josh Mansour, Adam Docker (Panthers), Anthony Milford, Jack Wighton, Jarrod Croker, Josh Papalii (Raiders), Daniel Tupou, Michael Jennings, James Maloney, Mitchell Pearce, Boyd Cordner, Aidan Guerra, Jake Friend, Dylan Napa (Roosters), Anthony Watmough, Brenton Lawrence, Daly Cherry Evans (Sea Eagles), Cameron Smith, Cooper Cronk, Ryan Hoffman, William Chambers (Storm), Aaron Woods, Robbie Farah (Tigers), Greg Bird (Titans), Jacob Lillyman (Warriors).